This disease causes great loss in dairy industry. The cows of North American and European origin suffer most. They do not die of this disease but they are out of production reproduction and they may become lame which is a big burden to the farmer and it may lead to failure of dairying. The buffalos are not affected by this disease. Out of indigenous breeds, Angol and Amritmahal breeds are resistant to this disease. Because this disease is caused by five type of viruses so a polyvalent vaccine is used meaning thereby that there are antigen against all the five type of viruses. These viruses can mutate and generate the sixth virus against which antigen is not present. So vaccination against this disease sometimes fails but usually, it works. They vaccination against this diseases should be done on the onset of winter and then again after six months after this vaccination at the end of winter season. This disease flare up during summer month and antibody production needs three weeks time. The young calf should be vaccinated at six days, six weeks and at six month period. The vaccine is very much available in the market and it should be maintained under 8 degree centigrade temperature. If the vaccine is not stored properly then it will not work. A separate needle should be used. This can be given to pregnant cows as well. 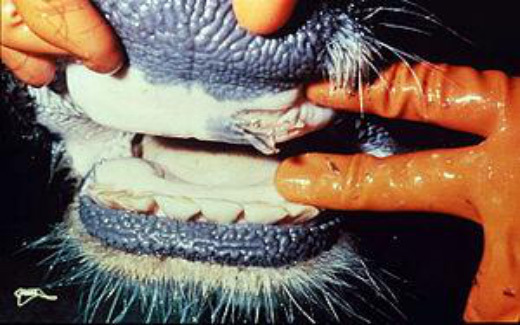 When there is outbreak of this disease, foot and mouth then the vaccine should not be given. The outsiders should not be allowed and there should be a restriction on the movement of vehicles and milkman. The milk should be properly boiled it is source of infection. Once a cow in a herd has suffered then all the cows will suffer. The cows go off feed, there is salivation from mouth and there is mild temperature. The cow may show signs of lameness and it will be shaking its legs. There will be wounds in mouth and legs as shown in the picture. 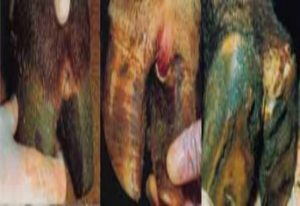 The foot wound may be infected with maggots which may ultimately lead to foot rot. This disease prevails for about ten to fifteen days. The pregnant cows may abort. The cows do not die but there is a total loss of production and reproduction. When animals are recovered then their hoofs are enlarged and in hot temperature, they paint. Their thermoregulation is upset they may show a body temperature above normal. These cows are carrier meaning thereby they have developed antibodies and they don’t fall sick of foot and mouth disease but they spread this disease to other cows. So you should not purchase such cows because they will spread disease. You can know this from the size of their hoof, lameness and painting during breathing. From my experience I may suggest that any kind of stress on cow will invite foot and mouth disease however apart from making cow comfortable you should boost immunity by injecting Levamisole injection @ 1ml 30 kg body weight once a month. To boost immunity you may try selenium and vitamin E injection sub cut under skin once a month. For this, you should take help of a veterinarian. The cow will not eat during infection so you should feed them soft food like chapati and rice. For relieving them from the pain you should try antihistamine and pain-relieving drugs through injection or orally. Antibiotic does not work because this is a viral infection.